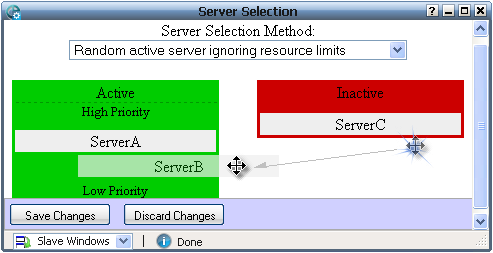 ▪ Random active server ignoring resource limits: Randomly select an active server even if the max allowed disk space, bandwidth or accounts for the server have been exceeded. ▪ Random active server with sufficient resources: Randomly select an active server which has not exceeded the max allowed disk space, bandwidth and accounts and can accommodate the resource requirements of the new account. ▪ Highest priority active server with sufficient resources: Select the highest priority active server available which has not exceeded the max allowed disk space, bandwidth and accounts and can accommodate the resource requirements of the new account. 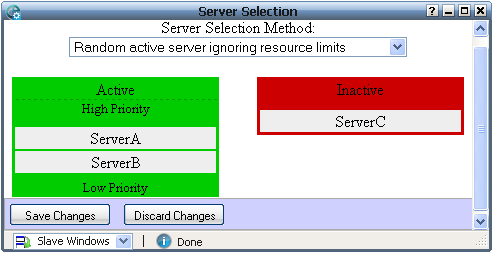 ▪ Active Server with maximum available disk space: Select an active server which has maximum amount of unallocated disk space. ▪ Active Server with maximum available bandwidth: Select an active server which has maximum amount of unallocated bandwidth. ▪ Active Server with maximum available accounts: Select an active server which has maximum capacity to accommodate new accounts, that is, select the server in which Max accounts minus used accounts is the largest.